It’s winter and the greens are so fantastic. I found this beautiful head of Escarole, and had to make this salad. Personally, I love this green. I prefer it in its natural state and I have been adding it to my daily salads. Yesterday I made this version to take to a party. I added roasted butternut squash and tossed it with an apple cider vinaigrette. It is very easy to make. This is what I did. First, using a vegetable peeler, peel the butternut squash. Cut the squash into small square pieces. Place on a baking sheet. Toss in a little olive oil, sprinkle with sea salt. Bake in a preheated 375 degree oven for 20- 30 minutes. Cook until the squash is tender. Let cool. Wash it very carefully. Cut into small pieces. Toss with the squash and salad dressing. Mix together the mustard and the vinegar. Whisk in the olive oil slowly. You will come out with a nice thick salad dressing. 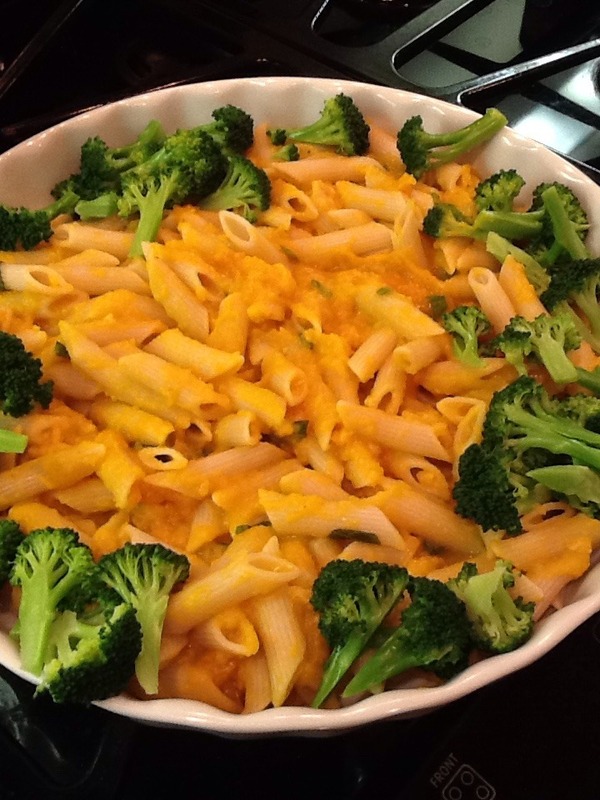 Butternut Squash spelt pasta with Broccoli. This is the season for butternut squash and other winter varieties. I found a beautiful squash at my local farmers market and could not resist making this pasta dish. It’s a real simple sauce and very easy to make. 1 butternut squash, peeled and cut up into 2 inch pieces. Line a baking sheet with tin foil or parchment paper. Place the squash and onion on the pan and mix with the olive oil, salt and pepper. Roast for 30-40 minutes until the squash is cooked through. add some stock until you get the desired consistency. It should be quite thick. Note: You can make this sauce ahead of using it. Bring a pot of salted water to a boil, add pasta, cook according to package directions. Throw some broccoli florets into the pot 3 minutes before the pasta is done. Toss the pasta in the butternut squash sauce, top with some Parmesan cheese and fresh herbs. 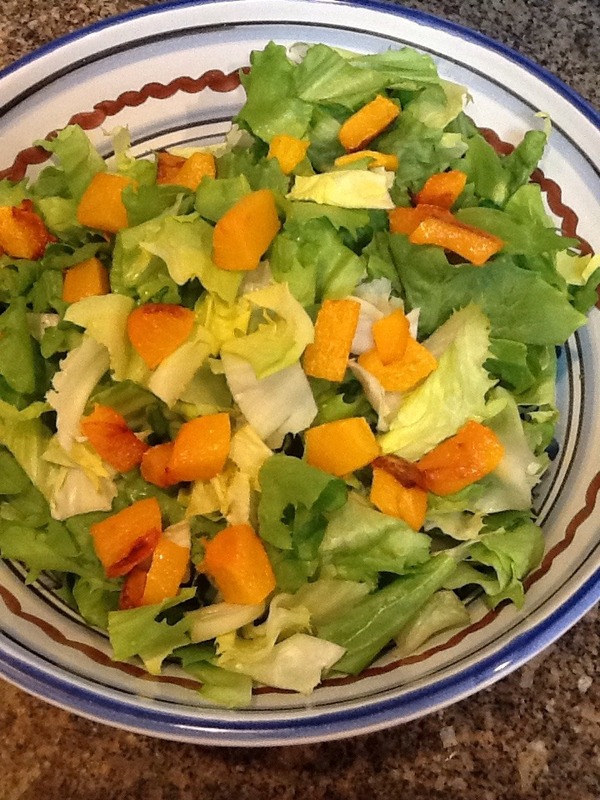 A very Alkaline salad for lunch today. A hard boiled egg, ½ of an avocado, and toasted pumpkin seeds on top. 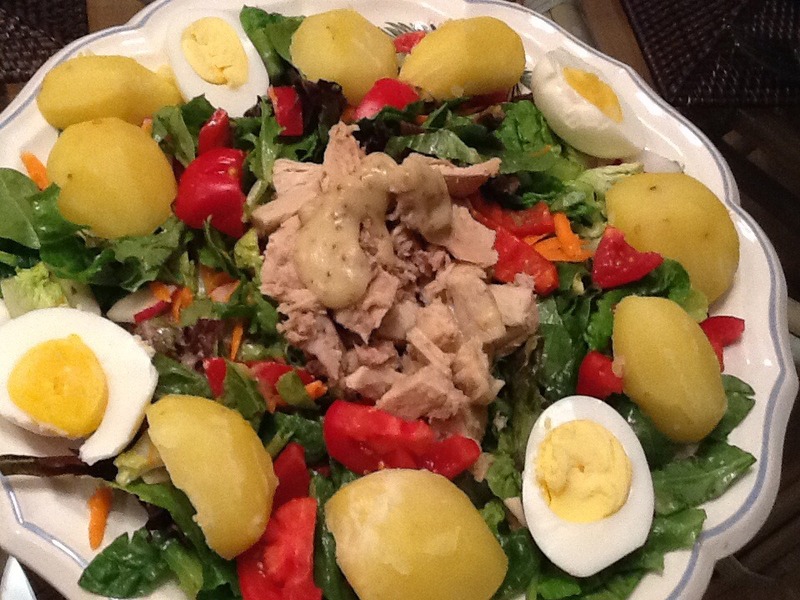 I served it with a basic vinaigrette using 1 tsp. French mustard, 1Tbsp apple cider vinegar and 3Tbsp. Olive oil. Mix together with a whisk until creamy. There is an abundance of summer squash in the markets right now. I have been buying many different varieties in my local farmers market. Any type of squash will work for this recipe. Note: **drain the zucchini or squeeze the moisture out in a paper towel. Heat a skillet , add the olive oil. Scoop by spoonful and fry the pancakes about 4 minutes aside. Drain on paper towels. And just enjoy. 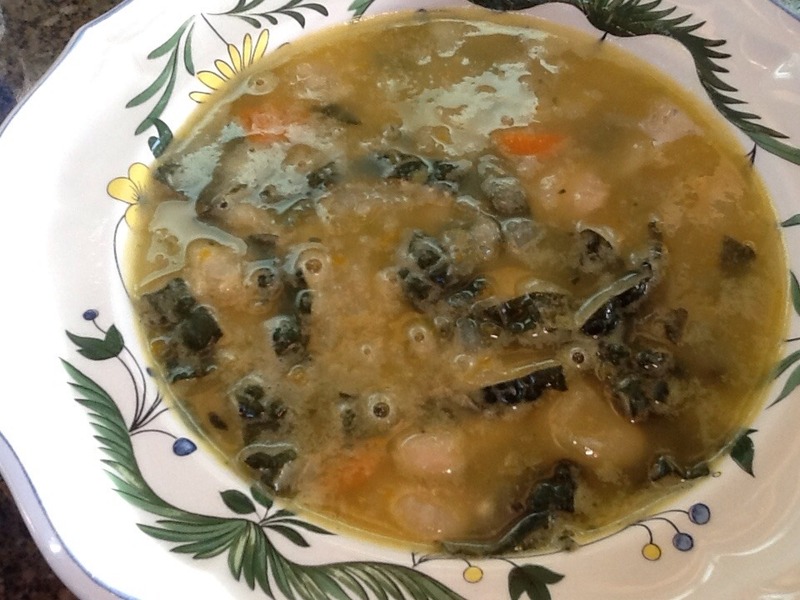 This is my white bean and kale soup. It takes a little time because I soak the beans, but you could substitute canned beans for a quicker cooking time. But if you can make the beans the pay off is huge. It is definitely worth it. Also you can freeze beans in their liquid. Really successfully. And the next time you want to make a pot of soup, all you have to do is go to the freezer. First I soaked large dried Lima beans ( alkaline) in a pot of cold water for 6 hours. They I drained them and put them back in the pot. 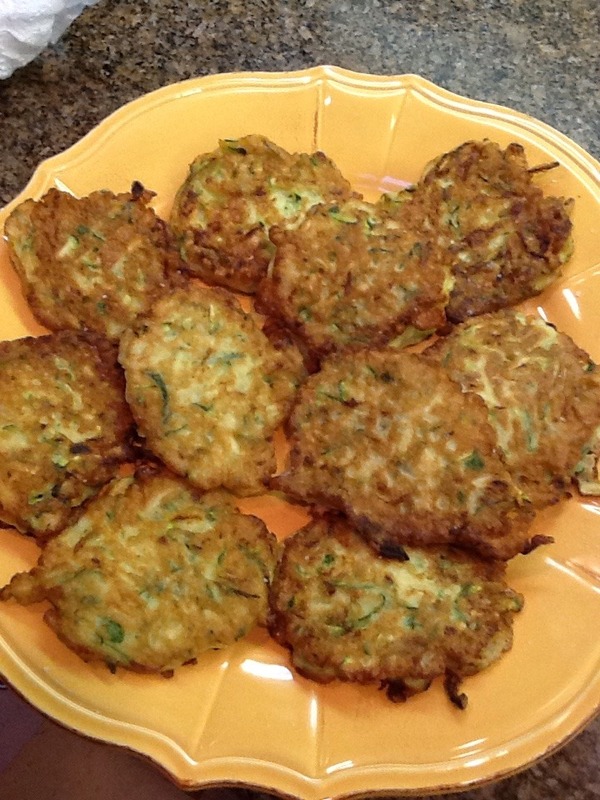 In a food processor, chop 1 onion, 2 carrots and 1 stalk of celery, into very small pieces. Add this mixture to the beans and pour just enough water to cover the beans. Bring to a boil and then simmer for about an hour. Cooking time varies. You might have to add a little boiling water to the beans if the water level gets too low. The beans are done when they become tender. I never salt my beans until they are done. Salt can slow down the cooking. Strain the beans into a bowl. Save the broth to use in the soup. In a pot, heat the olive oil. Add the onion and cook about 5 minutes or until they have softened. Add the carrots and celery. Season with 1 tsp of the salt and pepper. Add the kale stir. Cook for 2 minutes. Add the bean broth, bring to a boil and simmer for 30 minites. Add the beans and continue to cook for 15 more minutes. Taste and adjust seasoning. It will take 45-1 hour cooking time. Note: if you would like a creamier soup you can purée ½ cup of the beans and add them to the soup. I know it's May and I have not posted for a while. I have been having trouble on the current website that I am using. I am currently working on a new website which I hope to launch soon. But i will try to post whenever I can. Escarole and frisée both from the endive family, are plentiful in the farmers market. I also found a beautiful watermelon radish. It’s related to the Brassica family which includes, mustard, arugula, broccoli, cauliflower cabbage, kale, brussels sprouts and turnips. All personal favorites of mine. I love raw escarole so I chopped some up, added a few handfuls of curly frisée , a handful of parsley and cucumbers and topped it with a thinly sliced watermelon radish. Butternut squash, Brussel sprouts and crispy Kale. I had a fun day at the farmers market and put together this dish. It’s a little time consuming but very worth it. Line a baking pan with parchment paper or tin foil. 1 butternut squash, peeled and chopped into 1 inch squares. 2 tsp. fresh or dried thyme. 1 Tbsp. plus 2 tsp. olive oil. 8 - 10 leaves of dinosaur kale, veins removed. Slice the kale into strips. place the kale on the baking pan and coat with 2 tsp. of olive oil and salt and pepper. Place in the oven. Cook for 15-20 minutes until crispy and bright green. Transfer to a paper towel. Set aside. Raise the oven to 375 degrees. Place the squash pieces on the baking tray, drizzle with 1 TBSP of the olive oil. Sprinkle the thyme, a little salt and pepper and mix. Bake about 30 minutes until the squash is tender. While the squash is in the oven, simply steam the Brussel sprouts. Place on a steam rack, place in a pot, add water, cover and cook for 8-10 minutes, until done. Place the squash in a serving bowl. Arrange the Brussel sprouts over the squash. Top with the crispy kale. 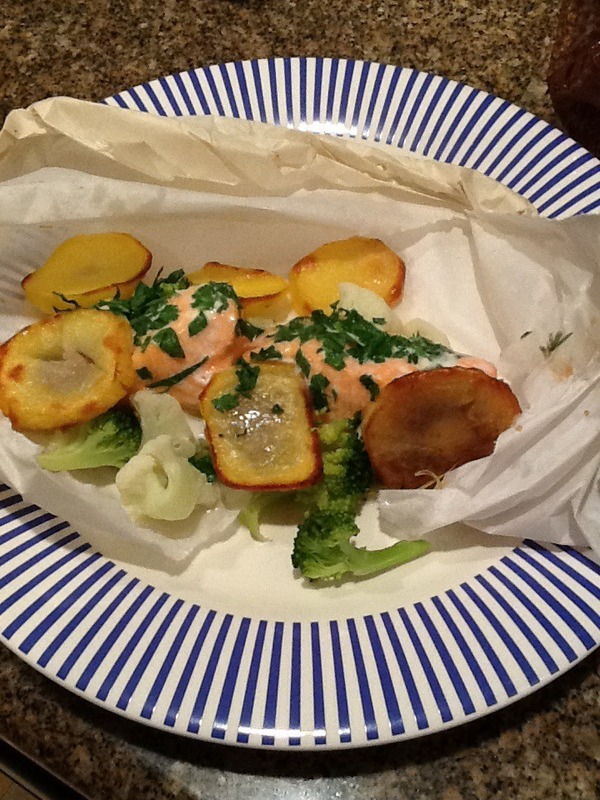 Salmon baked in parchment paper. This is a very easy preparation. The best part is that you can make up the packages in the morning and put them in the oven for dinner. I used 2, 4 oz. pieces of wild caught salmon. ½ Tbsp. Fresh dill, chopped. ½ cup white wine or stock. Slice the potato into thin slices. Place on a baking pan and drizzle just a bit of olive oil over them. Sprinkle with salt and pepper and bake until crisp. About 20 minutes. Set aside. Steam the broccoli and cauliflower. Place a piece of parchment paper on a flat surface. Place 1 piece of salmon on one side of the paper. Remember that you are going to fold over the paper to form a package. Season with a little salt and pepper. Sprinkle half of the dill and parsley, and half of the vegetables. Place half the potatoes around the edge. Squeeze one half of the lemon over the fish. Also add 2 Tbsp. of wine or stock. Start on one side and make a small fold to bring the edges of the paper together. Continue to make small folds until you get to the end. Make the last fold and tuck it under. Place it on a baking pan. Repeat the second package. At this point you can place in the refrigerate or you can cook them immediately. Bake in a preheated 375 degree oven for about 12 -15 minutes. Remove from oven, place each package on a dinner plate. Serve. Punch open the package with a knife and enjoy. This is a delightful fresh tasting salad. I made it today for lunch. A friend joined me and we ate the whole thing. It was just so yummy. Take the kale off the stems. Chop it into small pieces. Place in a salad bowl and squeeze the ½ of lemon over it. Let it sit while you prepare the rest of the salad. Slice the celery and grate the carrot. Add to the bowl. Dice up the avocado and add to the salad. Mix the mustard with the apple cider vinegar. Slowly whisk in the olive oil. It will emulsify into a nice thick salad dressing. Pour over the salad, mix and serve. You can add salt and pepper to your liking. Note: You can make and dress this salad up to 3 hours before serving. 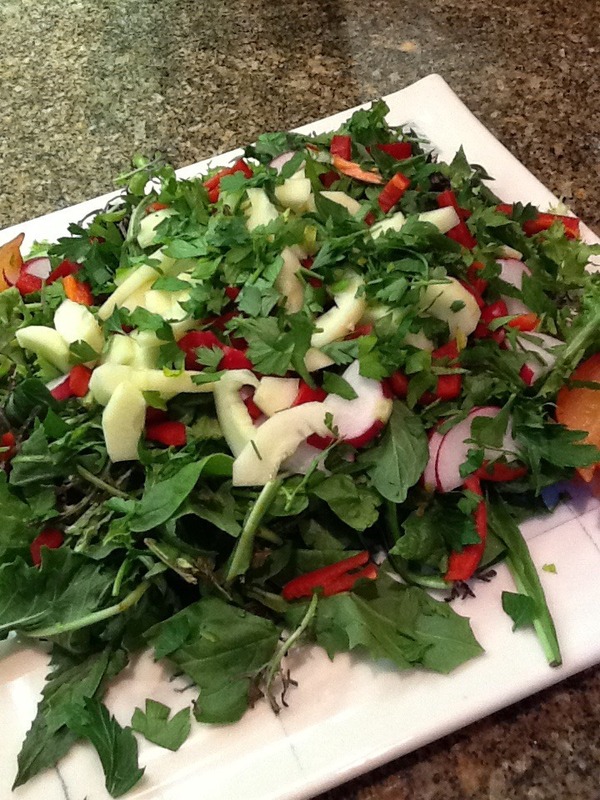 This salad is a fun way to present a salad for a party or large crowd. I bought some little Gem Lettuce at the farmers market. I chose this slettuce because it holds the vegetables well and it’s easy to just pop in your mouth in one bite. It’s a fun presentation and easy to make. You can use any salad vegetables you like. This is a crowd pleased salad. Also great for a Thanksgiving side dish. 1 pound of raw Brussel sprouts, sliced thinly. Note: Dress this salad a few hours before you serve it. It will help tenderize the vegetables. I used black and yellow lentils for this soup. 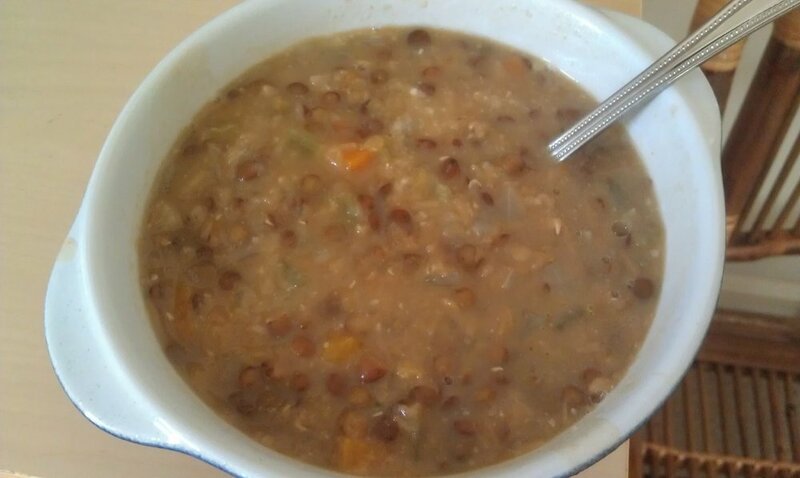 The black lentils keep their shape in the soup. The yellow lentils melt into the soup and give it a very creamy texture. I like to dice all the vegetables about the same size. It makes for a better presentation. Heat the olive oil In a medium soup pot. Add the onion and cook for about 6 minutes or until the onion has softened. Then add the celery, carrots and potato. Stir. Cook for 2 minutes. Add the lentil and stock. Bring to a boil, lower the heat at simmer for 1 hour. *Stirring occasionally. Now you can season your soup. Add the salt and pepper. Note : I have found that sometimes when I add salt too soon in the cooking, the lentils can get hard. So just like cooking beans, I prefer to salt after they have cooked. *Note: Have some stock reserved. As the soup thickens and the lentils absorb the stock you might have to add another cup of stock. This is another salad on a plate instead of a bowl. It’s a fun presentation. I bought some beautiful greens at the farmers market. I added some chopped parsley, sliced cucumber, sliced red bell pepper, sliced radishes, and a cut up avocado. Dress with your favorite dressing. A great side dish that I frequently make are roasted potatoes. They are so popular I seem never to make enough. I like using small potatoes cut in half. Place on a baking sheet and pour a little olive oil just to coat the potatoes. Roast in a 400 degree oven for about 40-45 minutes until they are done. They should be crispy on the outside and creamy in the middle top with some chopped parsley. Beets are such a fun treat. You do not always have to cook them. 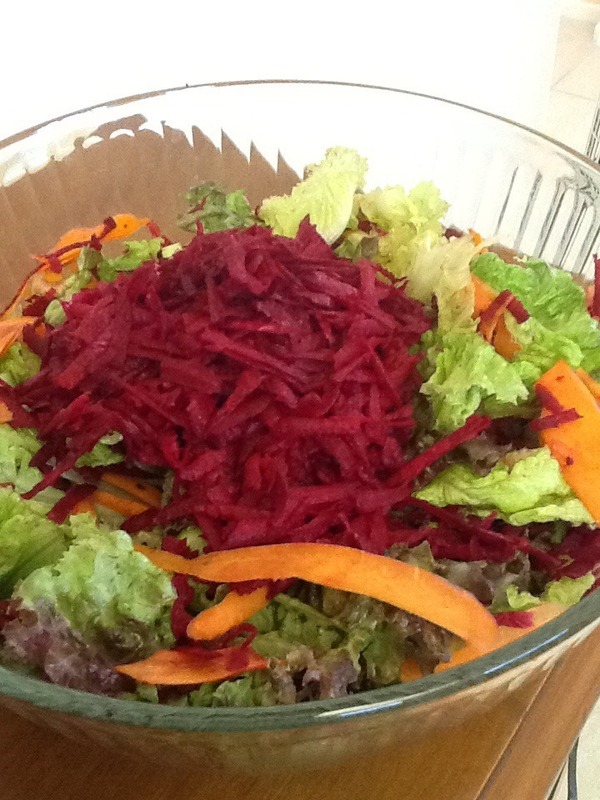 I love raw grated beets and I incorporated them into a fun colorful salad. Fill your bowl with lettuce. I used a vegetable peeler to peel the carrot strips. Peel the beet to remove the hard outside. Then grate the beet and place in the bowl. Add 2 stalks of celery. Cauliflower is in season in a variety of colors. You can make an orange or even purple soup. I prefer the original pure white cauliflower. I used one for this recipe. This soup is going to be roughly puréed so everything just needs a rough chop. Heat a soup pot. Add the oil and onion. Remember that all the vegetables just need a rough chop. Cook about 8 minutes over medium heat until the onions have softened. Careful not to brown them. Add the remaining vegetables, cover and steam for 4 minutes. Add the salt and pepper. Pour in the water just 2 inches above the vegetables. Simmer over low heat for 30-40 minutes until the cauliflower and potatoes are cooked through. In small batches, purée the soup. I think this soup lends itself to being a little chunky, so go light with the purée. if you prefer a creamier soup you can purée it all the way. Adjust your seasoning, Sprinkle with one of your favorite green herbs. I used parsley. 1 red bell pepper, remove seeds and core, then slice. Dress with a lemon olive oil dressing. 1 tablespoon lemon juice to 3 tablespoons of good quality olive oil. Whisk together and add to your salad. This is a salad that I made recently. I did not have very much lettuce, so I used lots of fruit and vegetables. 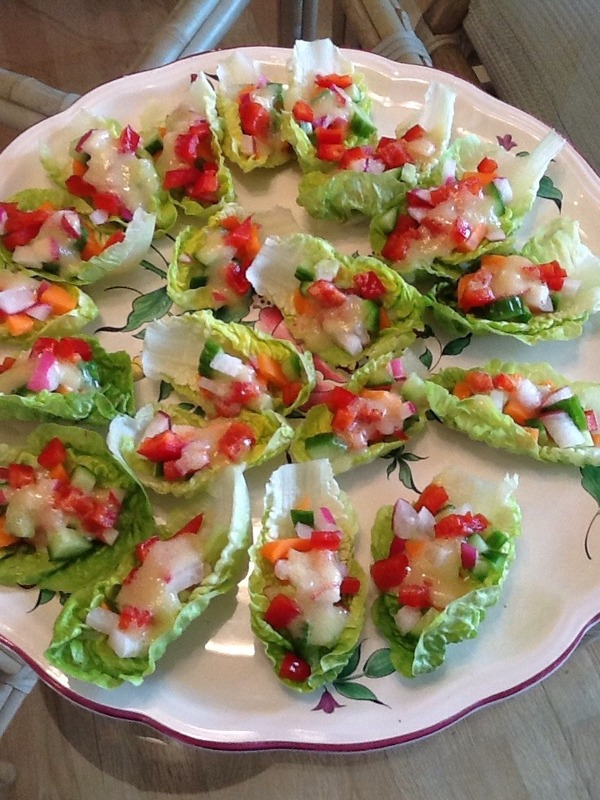 A small bunch of Frisée cut up and placed on a plate. 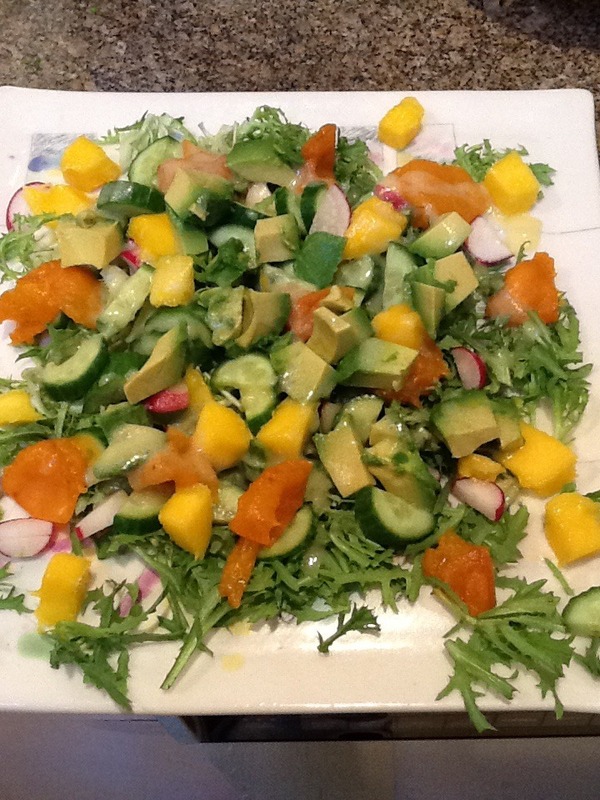 Then I added sliced radishes, some cucumber, avocado, mango and fresh sweet apricots. Feel free to add any fruit that is in season. Toss with your favorite dressing and enjoy.